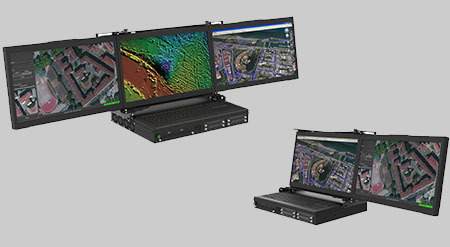 The MiniPac CP is a new concept in transportable workstations. It is designed to provide high-end features, with up to 3 folding 18.5” FHD displays, up to 12 Xeon Cores, up to 128GB memory, Intel embedded graphics or nVidia Quadro P2000/P4000 graphics, and 4 removable SSDs, each up to 3.84TB. Perhaps the most interesting feature is its compact size which fits into a 22” x 14” x 9” rollaboard TSA baggage which travels in the aircraft overhead. Also included is a MIL STD 810G transit case for shipping the product as freight. The TSA rollaboard bag nest inside the transit shipping case. There are three motherboard configurations all with either 2 or 3 folding displays. The MiniPac8060CP is a Core i7 quad core motherboard with an open PCIe 3.0 x 16 slot. Embedded graphics on the motherboard can drive all the displays or an optional add-in nVidia Quadro P2000 or P4000 can boost performance. If add-in graphics is not needed a data acquisition, communications, or RAID controller can be installed. The MiniPac8061CP takes it up a notch with the Xeon D motherboard with a 8C/16T processor and up to 128GB of ECC memory. The Xeon D motherboard does not have serious display support so you will want to add either an nVidia Quadro P2000 or P4000. Join this with the 15TB of removable SSD storage and you have a truly powerful Geospatial workstation or a Cyber workstation. Impressive are the two GbE and two 10GbE ports (4 total Network connections) that are standard on the motherboard. The MiniPac8071CP takes it up a notch by punching to a 12C/24T Xeon D. All other features remain the same as the MiniPac8061CP. The rollaboard bag meets TSA requirements of 22" x 14" x 9" and provides a custom foam reciever for the product. In addition an Explorer 7630 roller case is included as a MIL STD 810G for shipping the product freight. The rollaboard bag nest withing the Explorer case. If no rollaboard bag is required a Pelican 1610 hard transit case is provided.